Prior to the passing of the Reform Act the right to vote in local and Parliamentary elections was securely held by the burgesses who not only had the right to vote they also had the right to appoint further burgesses. Under such circumstances it is hardly surprising that corruption was rife and as is usual in such circumstances those in power were reluctant to slacken their grip. By the early 1830s though, that grip was indeed being loosened. The Reform Act removed the right to vote from almost all former burgesses unless they could demonstrate a continuous residency within the Borough of Portsmouth for at least three years, and, they either owned or occupied property that had a "clear yearly Value of not less than Ten Pounds". Initially the Act only increased the overall numbers of burgesses by about 18%, and they were all men, but it was a beginning of the move towards universal franchise, a process that was to take almost a hundred years. The Act was due to take effect from November 1835 so a list of those entitled to vote had to be prepared well in advance of that date. The government pronouncements suggested that this should be accomplished by July 1835 and that the Overseers of the Poor were responsible for creating the list. Once the Overseers had completed their task the resulting list of voters was handed to the Borough Council for endorsement and publication. 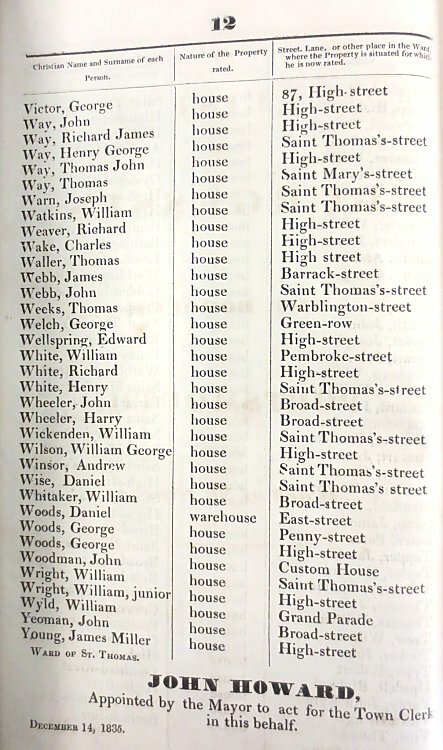 "The list of Burgesses for the ward of Saint Thomas being the first list after the passing of the Reform Bill was made out by the Overseers personally, occupying them three nights consecutive at the old Poor House, Warblington Street. Overseers: William Wright, Chairman, John Eyre Vardy, Henry Childs, Joseph Galt. What followed was a list of persons who owned or occupied property within the fortifications of Portsmouth (St. Thomas's Ward) having a value of at least £10 which thereby entitling them to vote. The list placed the burgesses in approximate alphabetical order together with the name of the street in which the property lay. There was no indication as to whether the named person actually lived in the property or rented it out and lived elsewhere and there was no proscription against naming the same person several times according to the number of streets in which they owned property. A heading to the list claimed that there were 1000 rated persons in the Ward 'to the amount of 15,000l' but it is unclear what information this is intended to convey as there are only 379 persons named on the list. There followed similar lists for each of the other five wards but in their cases the rated persons are grouped according to the street in which their properties lay. Again, the headings claimed totals for each ward as follows - St. John's Ward had 1,301 rated persons including 286 electors, St. George's 1,500 (351), All Saints 2,094 (404), St. Paul's 2452 (488) and St. Mary's 367 (93). The Overseer's list is dated 7th November 1835. There are no further lists compiled by the Overseers in the records. A revised edition of the list of burgesses appeared on 14th December 1835 under the name of John Howard who was 'Appointed by the Mayor to act for the Town Clerk in this behalf'. 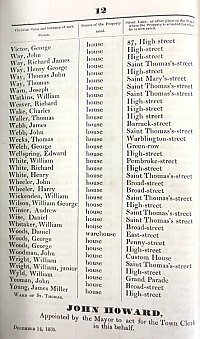 This version retained the approximate alphabetical order but, for the Ward of St. Thomas, added in 4 names omitted from the Overseer's edition. Oddly, one of the omitted names was Thomas Ellis Owen. These additional entries differed from the others in that the house number of their property was included with the street name, a practice that was abandoned almost immediately and not resurrected until 1850, and even then only partially. The arrangement of names in the other wards followed the same layout as for St. Thomas's. Also added was a simple description of the property involved, the majority being 'house' with a few 'warehouses' and some 'counting houses'. "All within the Lines of Fortification in Portsmouth..."
"The North-side of Queen Street, including all the buildings within the Lines of Portsea, to the harbour northward, and including the Dockyard..."
"The South-side of Queen Street, and all the buildings to the water of the Mill Dam, within the Lines of Fortification of Portsea, including the Gun Wharf..."
"All to the left from Lion Gate without the Lines of Portsea to the corner house opposite the Blacksmith's Arms, thence to the left side of Lake Lane and up to the top of it, from thence to the bottom of Deadman's Lane, round the corner to Copnor and Gatcombe House, from thence following the Borough Boundaries to the Sea-shore near Tipnor, and Fortifications of Portsea...."
"All to the right from Lion Gate without the Lines of Portsea to the Blacksmith's Arms, thence to and the right of Lake lane and up to the top of the same, thence to the right through Fratton to the top of Green-lane, down Green-lane through Green-road, through Park-lane to the Wheelbarrow Castle, and thence to the Borough Boundaries at Southsea, to the line of fortifications of Portsmouth...."
"And all to the Eastward of All Saints' and St. Paul's Wards as above described...."
The surviving copies of the Lists of the Burgesses held at the Central Library are a diverse group rather than a single edition. They must have been printed by almost every printer of note during the middle of the 19C. The first edition by the overseers carries no printers mark but the six ward lists for 1835 produced by the Corporation were all printed by W. Harrison of High Street, who also published the Hampshire Telegraph. The copies from 1838 and 1839 are split between Harrison and S. Horsey of 43 Queen Street whilst in 1840 J. Williams of Queen Street shares the honours with Harrisons. 1841 sees 4 different printers in action with H. Gardner of 6 Queen Street and H. Roe of North Street alongside Harrison and Horsey and 1842 adds William Woodward, Hard, George Moxon, Queen Street and J. Miller Jun., High Street to the list. A later addition is Henry Hollingsworth in 1850. Regardless of which printer is employed the format is consistent in layout and differs significantly only where some printers hyphenate the street names (eg. Queen-street) whilst others do not. The type face on each title page varies. The fact that different printers' copies have survived does not tell us whether the Corporation deliberately chose to use a range of printers or if each printer had siezed on the chance of issuing their own editions. There may have existed complete editions from each print shop each year but perhaps only a few from each have survived. It was noted above that the practice of including house numbers was not generally followed in the first few years after the Act came into effect. It is uncertain why this should have been given that a qualification for voting was the occupation of premises worth at least £10 per annum. Without the house number it could not readily be ascertained whether the person did indeed live in such a property. The picture is further muddied by another practice in which the elector did not even provide the name of a road for their property but simply gave it's location eg. Copnor, Buckland, Stamshaw. After about 15 years of permitting this lax definition of the property, house numbers were gradually introduced, but they were not introduced across the borough as a whole at the same time. St. George's and St. John's led the way from 1850 with the rest following along some years later. This suggests a remarkable degree of autonomy in the wards as one would, not unnaturally, assume that any decision regarding the contents of the Electors Lists would be made centrally and apply to all wards simultaneously. An alternative explanation could be that different printers approached their tasks idiosyncratically and that house numbers were in fact available but were in some cases deliberately omitted. Evidence for this might be available by cross-checking the names of the printers with the wards that adopted numbers but unfortunately by the time numbers were being introduced the practice of appending the printers names had become too erratic. We do know that from 1850 the list for St. John's was printed by The Portsmouth Times with typically florid frontispieces which allows us to guess that they didn't print the list for St. George's which had a plain frontispiece. Although we do not know for certain how the lists were compiled it seems logical to suggest that in some way they were based on the same method used to calculate who were due to pay the Poor Rate. This in turn would have been complicated by the passing of the 1834 Poor Law Amendment Act which sought to reduce the liability to pay the rate amongst the property owning classes. Whatever the reasoning, there is clear evidence that no one fully understood the implications of the various acts. In the first couple of years of electors lists the vast majority of declared properties were labelled 'house' with a very few termed 'counting-houses' (or office). No properties indicated the presence of industrial activity. Gradually however there appeared a wider range of descriptions including 'store', 'boatyard', 'canteen', 'brewery' etc. and in 1840 there were two instances of 'brick-kiln' and a plethora of property labelled 'garden', notably in Garden lane, St. Mary's Ward. It is worth following one person on the early lists who was plainly testing the waters, the most obvious perhaps being Edward Carter, mayor in 1835/36. In the first list his name appears in St. Thomas Ward against a property labelled 'house' in High Street which is hardly surprising as he lived at No. 19 High Street. In the next list he also appears in All Saints ward against a 'warehouse' in Union Road and in 1840, his name suddenly appears in the St. George's Ward list against a 'brewery' in St. George's Square which we know would have been part of the Pike Spicer group. Also listed are two other members of the Carter family who also declare a right based on the same brewery. The Carters maintain their connection with the brewery through each list until 1844 when the properties against their names in St George's Ward changes to 'house' despite the fact that in Edward Carter's case he was still living in High Street. There is no further mention of the brewery. Within 10 years of the first list being compiled the number of references to industrial properties had diminished markedly to leave the term 'house' to describe over 99.5% of the property. In 1845 the first ward to include no business properties at all was St. Mary's. The decades following the introduction of the 1832 Reform Act saw a period of almost continuous growth in the population on Portsea Island with a corresponding increase in the number of electors, starting from a base of 2,565 in 1838 (1835 is disregarded as atypical, it being the bedding-in year for the new system and there were no lists in 1836 or 1837). For the next five years, up until 1842, the increase was discernable but hardly impressive at an average of less than 1% per year. In the next phase, to 1847, the average shot up to 6% per annum but this was not sustained as the years 1849-1852 saw a return to annual increases of around 1% such that by 1852 the total number of electors stood at 4,106. Then something unexpected happened. The increase in numbers between 1852 and 1853 averaged an unprecedented 37% across the six wards, a phenomenon that demands an explanation. The first thing to note was that although the explosion in numbers occurred across all six wards it did so in varying degrees, and, as we shall see, for differing reasons. In St. Thomas's, St. George's, St. John's and St. Paul's wards the totals increased by 27.9%, 33.8%, 21.85% and 32.9% respectively, whilst in All Saints and St. Mary's the equivalent figures were 56.32% and 55.95%. The difference between these two groups of figures can be partially explained by noting that the 1850s was a period of exceptional house building activity and that if new housing areas were to be opened up on Portsea Island then they would have to be predominantly in the wards of All Saints and St. Mary's both of which had extensive undeveloped hinterlands to the north and east of the main conurbation. It is therefore understandable that a greater expansion took place in those wards whereas most of the development in St. Paul's took the form of infilling between existing streets whilst in St. Thomas's, St. George's and St. John's there was physically no room left for development so the remarkable increase in numbers in those wards had to be caused by another factor. The change in the pattern of voter registration is probably seen most clearly in St. Thomas's ward, where the total number rose by 120 between the publication of the 1852 and 1853 electors lists; an increase from 430 to 550. In trying to pin down exactly where these new voters lived it is first noted that there was practically no change in numbers registered at addresses on the main streets of the town; on High St. it was 105 voters in 1852 and 98 in 1853, in St. Thomas's Street it was 52/51, Broad Street 44/52, St. Mary's Street 41/46 and Warblington Street 28/24. In contrast there was a large increase in numbers in Armory Lane, Crown Street, Prospect Row and especially in the back street Courts and Alleys, places that contributed 72 voters in 1853, 64 more than in 1852. The places where these new voters lived were renowned for their soul-sapping poverty. Some 20 years before 1853 they had been described by Henry Hawkes in his "Recollections of John Pound". He said of Crown Street that it was of "a low disreputable sort"; Warblington Street as "abounding in profligacy and loathsomeness" and the whole area as crowded with "utterly wretched inhabitants". There is no reason to suppose the conditions had changed much in the intervening years. Ray Riley in his examination of the Garrison Town in 1851 is more precise in that he documents the crowded and insanitary living conditions in the courts, reporting specifically that "the great majority of court dwellings were rated at £3, a handful being assessed at £2" which presents a problem when attempting to explain the increase in voters from the Courts, as one of the qualifying conditions for registration is the occupancy of property valued at £10 or more, way above the values commonly seen in the Courts. Are we looking at a form of voter manipulation? When individual cases are examined we see, for example, in Aylott's court there is John Hocking, a carpenter, Isaac Harding a Greenwich Pensioner, with Thomas Emery and Henry Cordery, both labourers, becoming enfranchised despite having lived in the same property since at least 1851 when they appeared in the census. None of them had been deemed eligible to register before 1852. The pattern was much the same across many other courts which provided voters for the first time despite there having been no general improvement in the properties; Luke's Court provided 5 new voters, Messum's 3, Mitchell's 2, Nelson's 8 and Carver's with 4. The same analysis can be applied across all the other 5 wards which show similar modes of increase although it is not so marked as the presence of Courts was largely confined to St. Thomas's (where 16 courts out of a possible total of 45 now housed voters) with a lesser number in St. George's and St. John's. If we are to further determine the motivation for the change in voter registration behaviour we need first to note that the relevant Electors' Lists for St. Thomas's were dated October 22nd 1852 and October 22nd 1853. Therefore any change must have reflected an issue of socio-political significance between those dates and the matter with most political volatility during that year was the proposed adoption of the Public Health Act. The driving motive behind the act was a desire to improve the living conditions of the poor and particularly the insanitary condition of their dwellings which had been considered a prime source of the outbreak of cholera in 1848. It was an issue that had been dragging on for several years and would not be resolved for another decade, the battle lines being largely drawn between those who would have to foot the bill for the improvements and those who saw the improvements as basic human rights. Unfortunately the former were very well represented on the Borough Council where a number of the slum landlords had influenced the debate for many years, chief amongst them being Cornelius Stigant who just happened to be Mayor in 1853. AN INCIDENT IN THE ELECTION FOR THE WARD OF ST. GEORGE.— An old man on the burgess list, and a denizen of that odoriferous purlieu miscalled " Rosemary Lane," had been obliged to take refuge in the Union. Early on the morning of the 1st, one of the Councillors for St. George's Ward (Mr. Solomon) was depatched in a carriage to bring him down to record his vote for the anti-sanitary candidates, and although it was discovered that the voter was in a room set apart for those affected with an unfashionable and troublesome complaint, said to be prevalent among her Majesty's subjects north of the Tweed, yet, nothing daunted, the quarry was captured, and borne off in triumph to the polling-place, redolent of brimstone and grease. We have not missed the courageous and honorable member from his usual haunts, and we are sure our readers will unite with us in the hope he may not become a victim to his temerity, and that the Council and Borough at large will not be deprived of his eloquence at the election of Mayor, on Wednesday next. It is possible to view the expansion in voter numbers amongst the poor as a calculated means by which those Councillors who were against the adoption of the Act could have been to deposed. For this to have worked however the inhabitants of the courts would have had to have voted en bloc against the landlord/Councillors but that was never likely to happen as those same electors were dependant upon those same landlords for the roof over their heads. In addition these tenants would probably have been politically naive and susceptible to coercion (especially as there was no secret ballot), and there is evidence, gleefully reported by the Hampshire Telegraph, to suggest this is exactly what happened (see right). All of these factors were features of the voter registration surge but they don't explain why it happened in 1852/53 when the issue of the Public Health Act stretched from 1848 to 1863. For an answer, we turn to an analysis of the whole Health Act debate by Norman Gordon in an unpublished essay entitled "Muckabites v Sanitisers". In it Gordon reports that the Muckabites held the upper hand for most of the early years but at a Council meeting on 21st February 1853 the Sanitisers scored a notable success when a motion proposed by Councillor Emanuel in favour of adopting the PHA was passed by 28 votes to 27. The Muckabite faction were not finished though as evidence emerged that Cllr. Henry Davey who had voted for the motion had changed his mind due to "constituency pressure". We cannot tell at this remove the nature of this pressure, but it would be coincidental in the extreme if the increase in voter numbers amongst the poor had not played some part. The Mayor, Cornelius Stigant called another council meeting for 14th March 1853 which was boycotted by the Sanitisers to the delight of their opponents who carried the motion to rescind the decision from the previous meeting by 28 votes to nil. In the Council elections in November 1853 the Muckabites succeeded in ousting several Sanitisers thereby ensuring that nothing would be done for another ten years. So, we have a possible motive for the increased voter registration, not, as originally suspected, organised by the Sanitisers to get rid of the Muckabites, but precisely the opposite. Knowing this though does not determine the mechanism whereby the proponents could circumvent one of the primary conditions for the entitlement to vote. If someone occupying a property worth £3 was accepted as a voter then it would appear that the law was being broken. Research into how this was done is ongoing but evidence may be thin on the ground given that the Hampshire Telegraph and most of the ruling faction on the Council obviously condoned it. 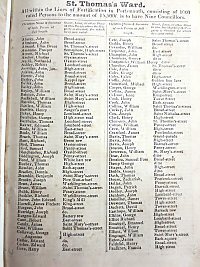 The issue of the Lists of Burgesses represents the first formal identification of those persons entitled to shape the nature of the community and it was important that the lists were published and available to the community. Prior to this time the only records that have survived were written down by Robert East in his Extracts from the Portsmouth Records published in 1891. 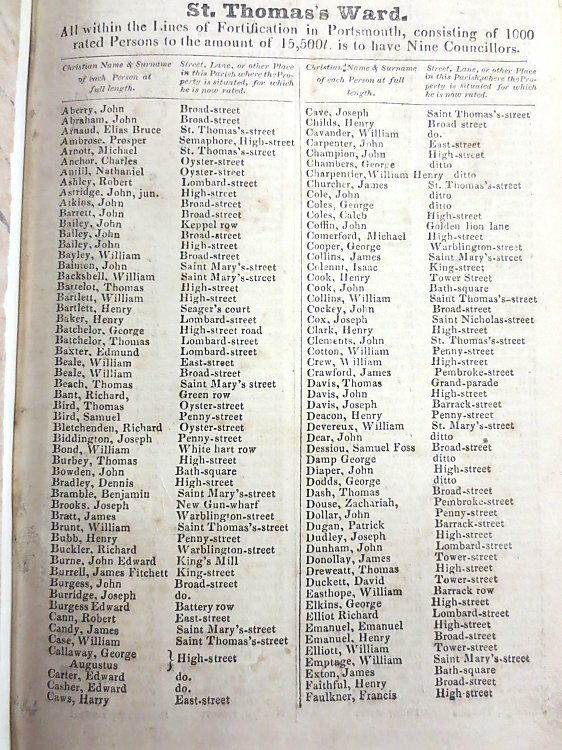 These were not so much an annual roll call of the voters but rather a series of names and dates upon which they were appointed burgesses. As a goodly number of them did not live locally it must have been difficult to keep a record of which burgesses were still alive and entitled to vote. On what data was the initial list compiled? Why was the Overseers list superseded so quickly? Did the inclusion of the same name several times in one ward or in different wards mean that they were entitled to more than one vote? These lists state they contain the names of all the persons entitled to vote in elections for 'Councillors, Auditors and Assessors'. Does this mean there is a separate list for Parliamentary elections? Why was the omission of house numbers considered acceptable and why did some people define their property in such vague terms as "Buckland" or "Kingston"
On what basis were wards permitted to adopt registration procedures unilaterally. If two persons (father and son?) both register their entitlement to vote based on the same property, did that mean that the property was worth two times £10? If not what was the basis of their entitlement? What were the implications of including industrial properties in the list and why did the practice die out? Why did Benjamin Bramble cite an Engine House in the Dockyard as his grounds for entitlement in St. John's Ward (1849 & 1850)? Many people mentioned on the Tithe Map do not appear in the voters lists. Does this mean that the property was not worth £10, that they lived outside Portsea Parish, or what? How was the 1853 voter registration scheme perpetrated?